Our hospice in Walsall has been caring for the community since 2011. 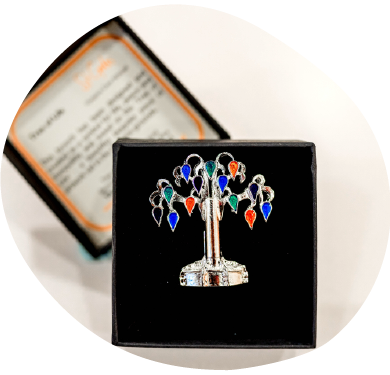 Our commemorative ‘Tree of Life’ brooch was specially commissioned to celebrate the fifth anniversary of St Giles in Walsall in 2016. The bespoke design of the ‘Tree of Life’ brooch, made from silver-plated pewter and enamel, is inspired by the Tree of Life sculpture by artist Tim Ward, which can be found in the courtyard at the heart of the hospice. This unique piece of artwork is an uplifting place for reflection and a symbol for life, peace and tranquillity. By wearing the brooch, you can show your support for the hospice and remind yourself and others of this life-affirming message. Coming soon – our Tree of Life necklace.